Warm temperatures and breezy, sunny skies have helped bring summer events to their full potential. Mid Michigan Community Action Agency has hosted two community events so far this summer, Fun Day in the Park and Fishing with My Family. Both events have brought families together to spend time, gather community resources and have some fun. Fishing with My Family saw nearly 150 participants in Morley, and it provided free fishing and many festivities for children and their families. All families who came to the event participated in the children’s activities, enjoyed free food and won many door prizes donated by generous sponsors. Fishing with My Family works with Michigan’s free fishing weekend, so everyone was able to fish and have fun without the requirement of a fishing license. The other event, the ninth annual Fun Day in the Park, was a day of music and movement in Shamrock Park in Clare. Nearly 350 people participated in activities and received community information. 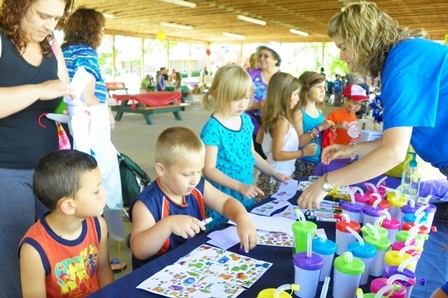 “It’s a great way for parents to find out about resources available, but have fun and spend time with their children as well,” said Joleen Golden, Mid Michigan Community Action Early Childhood Services director. Children kept busy with police car and fire truck tours, decorated their own guitars, enjoyed face painting and participated in the Clare Masonic Lodge’s MI-CHIP service. The MI-CHIP service is a program that was used to create a child ID packet which includes the child’s fingerprints, picture, video clip and other vital information placed on a computer disc that the parents can take home. Mid Michigan Community Action also held open enrollment for Early Head Start, and the Clare-Gladwin Quality Preschool Partnerships provided enrollment information for 3-5-year-olds who may be eligible for free preschool programs for the 2012-2013 school year. Free food was provided for all families which included hot dogs, chips, water and freshly popped popcorn. Door prizes were given throughout the day, and Isabella Bank donated two bikes for one girl and one boy. Many other sponsors gave away gifts and toys with their information. Registration for Early Head Start and preschool programs is still available. Contact Mid Michigan Community Action toll free at 1-877-386-4406 or visit www.mmcaa.org for more information. Fishing with My Family was made possible through the generous support of the village of Morley, United Way and community partners. Fun Day in the Park was made possible through the generous support of United Way and community partners.